The Gyp Hills Scenic Drive is a finalist for the 8 Wonders of Kansas because of the stunning red-colored butte-and-mesa topography. 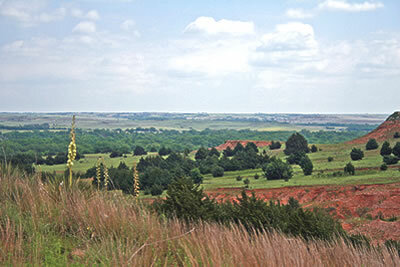 The Red Hills of south-central Kansas are one of the most surprising landscapes in Kansas. The rocks here were deposited during the Permian Period of geologic history, about 250 million years ago. During that time a large, shallow bay covered much of this area. When that bay was cut off from the ocean and the water evaporated, the rocks (called evaporates) that were left behind included salt and gypsum. Most evaporites are easily dissolved in water, and thus erosion sculpted these hills into the shapes you see today. Many of the rocks here are stained red by iron oxide, thus giving the name Red Hills to the area. Sandstones and shales, in particular, are bright red. Gypsum is a much lighter colored rock that is found in layers within those red beds. One type of gypsum, selenite, forms large diamond-shaped crystals that are common in the area, littering roadcuts and ditches like broken glass. Much of this 22-mile route is through open range meaning there are often no fences to keep cattle off the road. It's a public road but you'll cross cattle guards and it's the responsibility of the traveler to avoid hitting livestock. Also, travelers should make sure to follow the public road and not meander off onto pasture driveways. At times there are few signs of civilization and wildlife, wildflowers, birds, and cattle dominant the landscape against the Red Hills. It's confusing but the Gyp Hills Scenic Drive and the Gypsum Hills Scenic Byway are two different routes. See "location" below for explanation and directions. 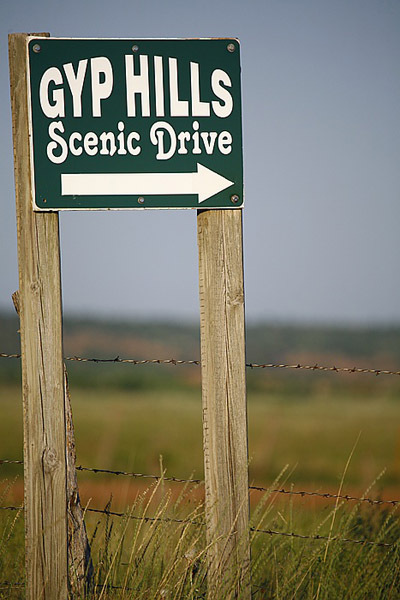 Location: About 3 miles west of Medicine Lodge on U.S. 160, find a sign that says Gyp Hills Scenic Drive. Head south on Gypsum Hill Road, then west. Watch for small green signs, and follow them. Much of the route is unpaved. Approximately 22 miles, the route will bring you back up to U.S. 160 on Lake City Road. If you'd rather not travel the backroads, you can still see marvelous Red Hill scenery by driving the Gypsum Hills Scenic Byway. 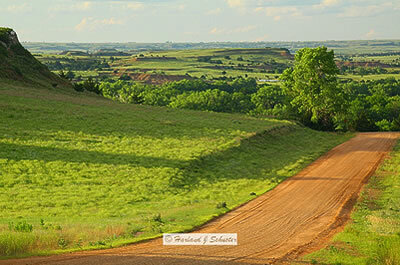 This official Kansas Scenic Byway runs from Medicine Lodge west on U.S. 160 42 miles to the U.S. 183 intersection at Coldwater (ksbyways.org).